Mix by hand at this point! Doug makes these cookies from an old recipe book; the authors of the recipe are Bev Almageur and Nancy Fry of Fargo, North Dakota. Doug has tweaked the original recipe a little. Whisk together the flour, baking soda, baking powder, and salt, and set aside. Combine the shortening and sugars, and cream well. Beat in the eggs until thoroughly blended. Add vanilla. Stir the dry ingredients into the wet, and mix well. Add oats and chocolate chips. Drop by teaspoonfuls onto a greased baking sheet. Bake at 350F for about 12 minutes or until golden brown. My addition: Roll out to a thickness of approximately 1/4″. Cut out into shapes using cookie cutter. Transfer onto a parchment-lined baking sheet. Bake for approximately 10 to 15 minutes. Mix like shortbread. Roll and cut, top with coloured decorations and cook in oven. When cool put together with butter icing (pink). I beat together the butter and icing sugar (confectioner’s sugar), then gently mix in the flour until incorporated. Gather up in a ball and roll out to about 1/4″ to 1/2″ thick. Cut out small shapes with cookie cutter; Grandma used a very small, fluted circle, about one inch in diameter. Place on a parchment-lined baking sheet, and onto each cookie sprinkle on a few of those tiny little coloured balls used for cake decorating. I bake in a 350F oven, for around 8 to 10 minutes; these should not brown, but do need to be baked through. Cool completely. Make little sandwiches by spreading one cookie with buttercream icing (pink, or not! ), then sticking another one to it. Freda brought these in to the Food Bank for our coffee break, and they are soft and delicious! From the PBS program “Everyday Food”, these really are yummy! Preheat oven to 350. Line a rimmed baking sheet with foil. Place graham crackers in a single layer on sheet, edges touching. You want to cover the entire baking sheet with graham crackers. Sprinkle toffee bits and almonds over graham crackers. In a small saucepan, bring sugar and butter to a boil over medium-high. Reduce heat and cook at a rapid simmer, swirling pan occasionally, until mixture is syrupy, 2 minutes. If desired, pour the hot mixture into a 2-cup glass measuring cup to make pouring easier. Immediately pour evenly, and slowly over graham crackers. Bake until sugar topping is bubbling, 12 minutes. Remove from oven and immediately sprinkle chocolate and salt over graham crackers. With a sharp knife or pizza cutter, cut into 2-inch squares. Let cool completely on sheet on a wire rack. Sugar Cookies made with half whole-wheat flour, rolled in balls, and flattened. 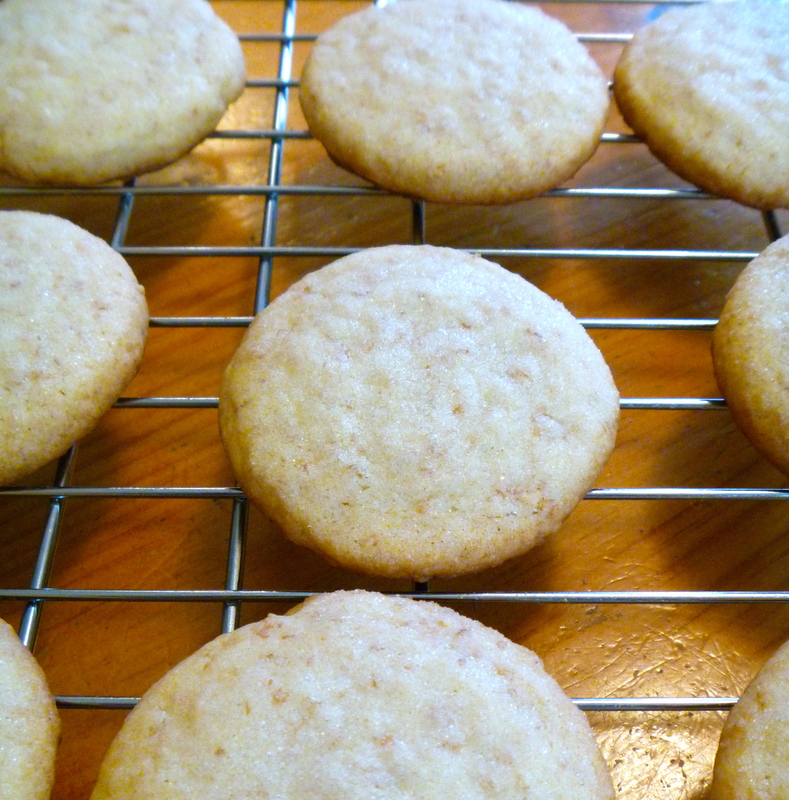 This is Shirlee’s recipe for sugar cookies; they do not require chilling, rolling, and cutting. She adapted the recipe from Land O Lakes’ recipe which uses only all purpose flour, instead of the combination. In a bowl, whisk together the flour, cream of tartar, and baking soda, and set aside. In the bowl of a mixer, combine butter, powdered sugar and 1/2 cup sugar in large bowl. Beat at medium speed, scraping bowl often, until creamy. Add egg and vanilla; continue beating until well mixed. Reduce speed to low; add flour mixture. Beat until dough forms a ball. Flatten to about 1 1/2 inches with bottom of glass dipped in sugar; sprinkle with decorator sugars, if desired. Bake for 7 to 9 minutes or until edges are lightly browned. Let stand 1 minute on cookie sheet; remove to cooling rack.